8 Pottergate mews is a newly built cottage that is smartly furnished to a high standard with all the benefits of a modern home and with a south facing garden. The property has open plan living room 2 double bedroom rooms one with double bed and one with twin beds. The cottage is only 2min walk to Helmsley market square where you will find Many shops and restaurants. One of the best locations in Helmsley. Modern bathroom has a large bath and shower and WC and a full length mirror. 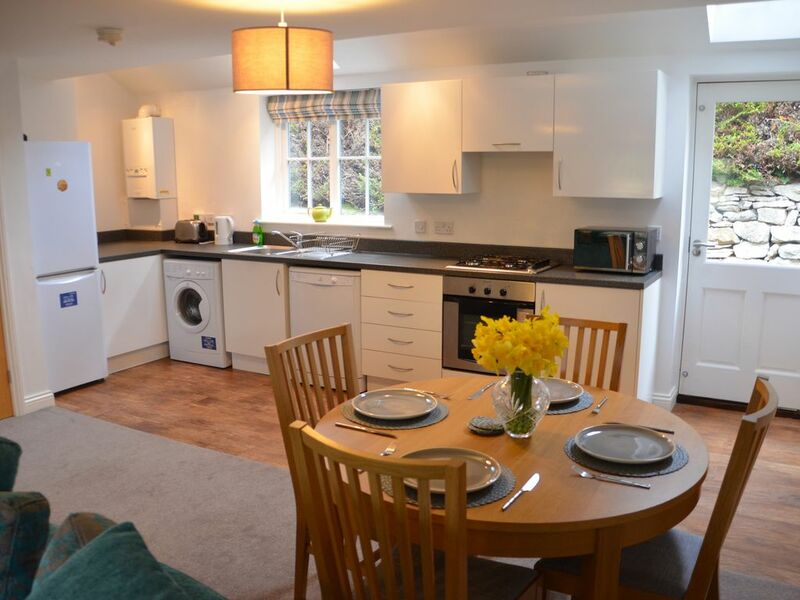 The kitchen has all the modern facilities you need:gas hob/extractor fan, cooker/grill, dishwasher, washing machine, fridge/freezer, microwave, toaster, kettle and iron and ironing board. There is also a dining table with seating for 4 people. Their are courses at Kirkbymoorside and Gilling. There are no steps into the house and has a downstairs WC. Outside: Lawned garden to the front with table and chairs. There is all so a small gravelled area at the back. Their is one dedicated parking place, any other cars can be parked on potter gate, their is also a shed where the bins are stored. Utility Room: Just off the kitchen there is a cloakroom and WC Cleaning / Towels / Linen / Maid service: Bedlinen and towels are provided. The property is cleaned for your arrival. If you would like additional cleaning, this can be arranged for a fee. Great stay, perfect location to explore Helmsley and the surrounding area. 8 Pottergate Mews is a comfortable modern property in a lovely location. Close to the centre of Helmsley and all its amenities yet peaceful and quiet. After an initial problem in getting access to the wiFi everything went smoothly and we very much enjoyed our stay. Myself & my family loved staying in Helmsley over New Year. Lovely cottage with everything we needed. Pottergate Mews is situated in a surprisingly quiet spot in the centre of the town. There is easy access to local activities. We loved the historic feel of the castle and walled gardens, the buzz of market day and yet were not far from the coast. The cottage is clean and airy and has everything we wanted. A thoroughly enjoyable stay. Thank you. My family & I found this cottage to be perfect for us - wonderful central location in Helmsley yet very quiet & peaceful. The cottage was very clean, modern & had all the facilities that we needed for a week long stay. Very easy & pleasant communication with the owner. We would definitely stay here again if we holiday in the area & I would not hesitate to recommend to others. We were sad to leave!!!!! Helmsley is an ideal base for visiting the North York Moors. The east cost about 40 minutes. York is about 40 minutes and local attractions like Riveaulx Abby Duncome park,All so lots of great walking opportunities. The Market square is just a 2 min walk, there are lots of shops good restaurants, cafes and bars and a couple of well known hotels. There is also a cost cutter, post office, a couple of banks and fantastic delicatessen and a few very good bakers. Booking Notes: We would need a deposit too secure your booking and the remainder 6 weeks before your stay, we also would need an extra £100 security deposit which will be refunded 10 days after you vacate. You can pay either by cheque or bank transfer. Please note there is a no smoking and no pets policy at the cottage. Please note that 5 and 6 day bookings will be charged at the week rate Changeover Day: All bookings run from Saturday to Saturday(although could be negotiable and may alter over Christmas and new year). You may arrive after 3pm and must depart by 10am.